Between the snow melt and the steady April showers, the Crooked River is high and spilling over its banks at Smith Rock State Park. To put it in perspective, last year when portions of the River Trail were under water, the flow rate for the river was 1160 CFS. 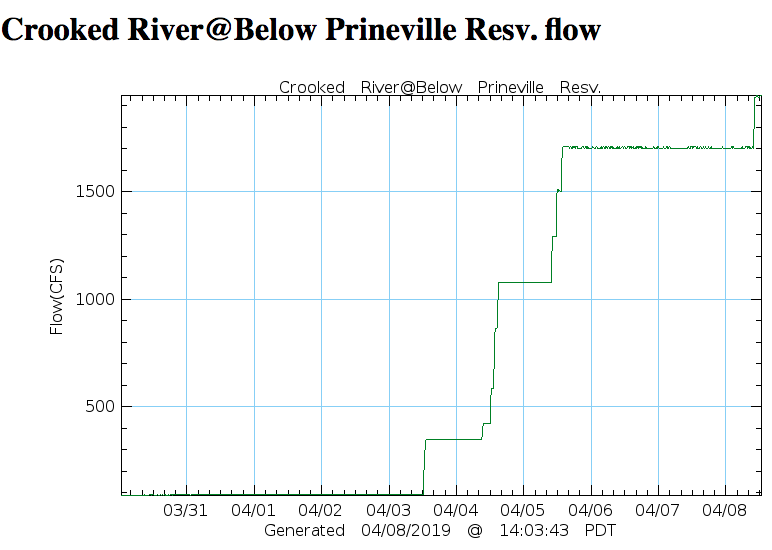 When signs went up a couple of days ago by the rangers to warn of trail conditions, it was 1820 CFS—today it’s at 1920 CFS for below the Prineville Reservoir. UPDATE APRIL 9: 2920 CFS! cubic feet per second (cfs)--a rate of the flow, in streams and rivers is equal to a volume of water one foot high and one foot wide flowing a distance of one foot in one second. One "cfs" is equal to 7.48 gallons of water flowing each second. Smith Rock State Park Ranger Nolan Ferdinand balances carefully where the Crooked River has risen 2 feet on the trail. There are two points at the south point where the river is 2-3 feet over the trail. There is access all the way but it does take some rock scrambling up a small cliff. In reality, we are putting warning hazard signs out in these areas encouraging people to not attempt it if at all possible.